The MKR 485 shield allows a MKR board to connect to other 485 devices. This board may be used with the Arduino RS485 and the Arduino Modbus libraries, available from the Library Manager. 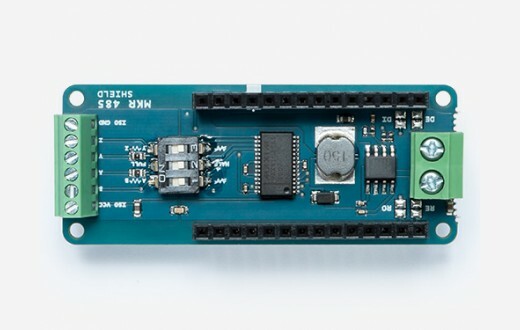 The Arduino MKR 485 allows the Arduino MKR family of boards to communicate with industrial automation systems or to extend the serial wired communication over much longer range. This shield supports half and full duplex with or without biasing and termination, master slave configuration. Most of these configurations are physical and the 3 ways dip switch allows you to set up the connection properly. This shield may be used with the libraries already available for 485 communication. This shield is compatible with the MKR family of Arduino boards.